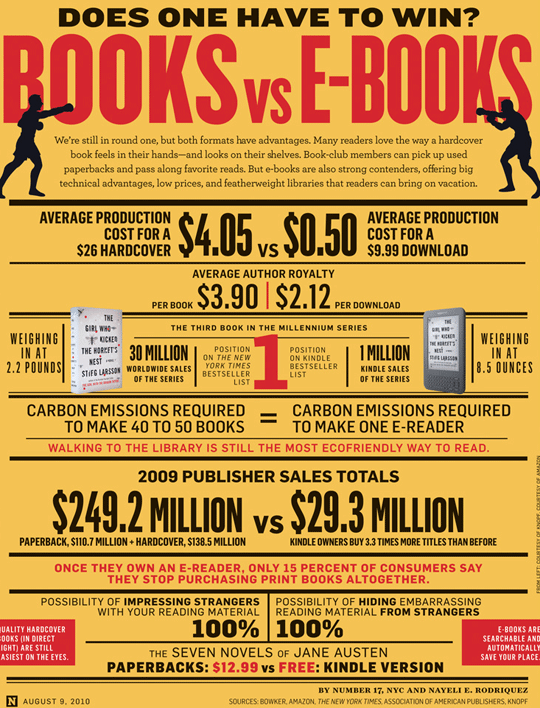 The Modern Debate: eBooks, Print Books, or Both? Like many writers, I love to read. eBooks, print books, it doesn’t matter–I’m not picky. I download eBooks by the dozen, pick up the classics at the local library, and can frequently be found on the weekends at random bookstores browsing 95 cent paperbacks. I choose to write eBooks only, because my tech-savvy YA audience seems to enjoy eBooks more than their print counterparts, but as far as reading goes, no books are off-limits for me! I’ve had numerous stimulating conversations with family, friends, and acquaintances over the last few months, with the specific question: print or eBook, which do you like better? I think preference may be a generational thing; my grandparents and parents prefer print books, although my forward-thinking mom has gotten into Kindle eBooks since I’ve been writing and publishing them. Antonio likes eBooks better, since they’re easy to read using the Kindle app on his Android phone and they’re “less clutter”–a constant concern in our house since we’re both semi-neat-freaks who have feng shui-ed our lives since moving to California. Many of our friends who, like us, are in their twenties and early thirties, prefer eBooks as well, although a few have said they enjoy the overall feel of print books, from the texture of the paper to the smell of the pages. I have to say that I agree with them. Some books, especially the classics, just seem better in print. Reading is, after all, a complete sensory experience; I just finished reading George Orwell’s 1984 in hardcover, and turning the pages of the print version made me feel closer to the characters and the time period in which the book was written and originally published. The majority of the teens I’ve talked to prefer eBooks, because they’re cheaper and easier to obtain than print books. Many teens say they love taking advantage of free eBook giveaways, such as KDP Select free days. A few teens, however, say they like “real books” (i.e. print ones) better, and are likely to pay more for a physical copy of a book than its eBook counterpart. When asked why, one teen told me that the print book just felt more “real” sitting there on the shelf than an eBook would feel buried away in the recesses of a tablet or ereader. They’re less expensive than their print counterparts–sometimes free! They’re quicker and easier to obtain than print books. They take up no physical space–great for traveling or just feng shui-ing your life! They provide a great way to discover new authors and genres, and many eBook novellas are out there for reluctant and / or pressed-for-time readers. They’re fun and easy to read on tablets, ereaders, and smartphones. They require no technological prowess–just open and enjoy! They have a distinctive texture and aroma that enhances the reading experience. They feel more “real” when you can handle them and see them sitting on a desk or shelf. It’s easier to peek ahead if you’re curious about the ending. :). You can borrow them from the library for free. Which form of book do you prefer, print books or eBooks, and why? I’d love to hear your thoughts!